Do you say sauce or gravy? Depending on where you are from, you may have a strong preference for calling the tomato based concoction served over spaghetti either sauce or gravy. Some say when meat is cooked with the sauce it is called "gravy" and when there is no meat, it is called "sauce". If that is true, then today's recipe is really "gravy", but in my neck of the woods, we refer to all tomato-based sauces as "sauce". I make tomato pasta sauces all the time. 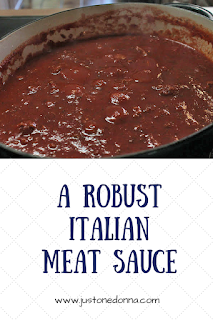 Sometimes the sauce is quick and easy, and other times the sauce cooks for several hours to develop depth of flavor. When you want a robustly flavored sauce you generally must let it simmer for a bit to get the richness and depth of flavors you desire. That is the case with today's recipe. 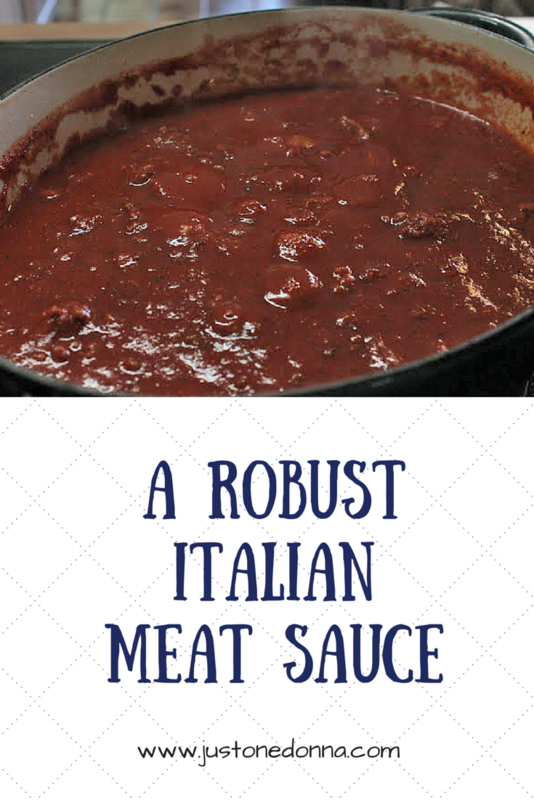 The first layer of flavor in this sauce comes from the combination of sweet Italian sausage and ground beef, cooked together until very well browned. You do not want to hurry the browning of the meat. Browned meat means delicious flavor. The next layer of flavor comes from the addition of simple seasonings and some secret ingredients. My sons used to ask me what made my sauce taste so yummy and I would tell them it was "the love" that only their momma could add. Well, that is true when Momma adds a little bit of this and a little bit of that to get the flavors just right. In this dish "the love" comes from a little bit of red wine, a tablespoon of sugar, a pinch of red pepper flakes and a couple of tablespoons of Parmesan cheese simmered with the sauce. Finally, the flavor is taken over the top with a couple of hours of gentle simmering on the stovetop. You can actually see the flavor cooking into your sauce as the color changes to a deep, rich red. It will call out to you to break off a chunk of crusty bread and dip it into the sauce after simmering there on your stove. I like to bake up a tasty focaccia bread while the sauce is cooking for just this purpose. This is a perfect sauce to make on the weekend. You can serve it on top of your favorite pasta, like I am doing today, use it to make a delicious lasagna for later in the week, or freeze it in meal-sized portions for meals later in the month. Begin by heating a large, heavy pot over medium-high heat. I don't add any oil to the pan because the sausage and ground beef will render enough. Add the sausage and ground beef to the pan, breaking up any chunks of the ground beef. Season well with salt and pepper, starting with 1 teaspoon of salt and 1/2 teaspoon of pepper. Cook until the sausage and beef are well-browned and there are lots of browned bits on the bottom of the pan. Add the chopped garlic and cook for 1 minute. Add the red wine, stirring to release the browned bits from the pan. You may need to add a little water as well if there are still lots of bits on the pan. Add the tomato paste and stir to coat the meat with the tomato paste. Add the crushed tomatoes, diced tomatoes, sugar, Parmesan cheese, red pepper flakes and basil, crushing the basil between the palms of your hands before adding. Bring the sauce to a boil and reduce the heat to simmer. Simmer on the stovetop for two hours; stirring occasionally to be sure the sauce at the bottom of the pan doesn't burn. After two hours, taste for seasoning and adjust as needed. This is where you make the flavors in this sauce your own. Add what you like. Stir in the chopped parsley just before serving. Cool completely before refrigerating (using an ice bath) or freezing. Serve with your favorite pasta. Check out my recipe for Classic Italian Lasagna. Don't miss this Vegetable Lasagna recipe. I love making homemade pasta sauces. I wish my husband liked red sauces - they're my favorite. I'm pinning this and making it for when the family is all around. HAHA I can do an alfredo for him on the side.